Such a healthy, hearty, tasty dish – this meal can be on your table in less than 40 minutes. Spanakorizo (Σπανακόριζο) is traditionally served as both a main and side dish. Pair it with a wedge of lemon and a piece of bread, this dish is delicious right off the stove or served at room temperature. Guaranteed to become one of your go-to Greek vegan and Meatless Monday recipes, spanakorizo is another great option for take-to-work/school lunch. 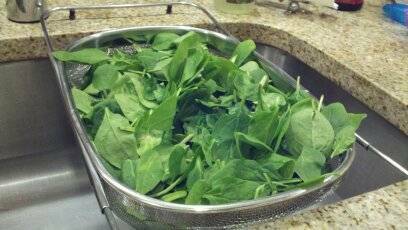 I use fresh spinach probably 90% of the time but in a pinch,will use frozen spinach with perfectly fine results. Which type of spinach you use is completely up to you and you can experiment with different varieties. My favorite is spinach that is still attached to the roots. This kind of spinach, though not available regularly in my area, has the sweetest stems! I keep as much of the stem as possible and cut as close to the root bulb as I can. Bite a piece of raw stem and you’ll taste the difference immediately. 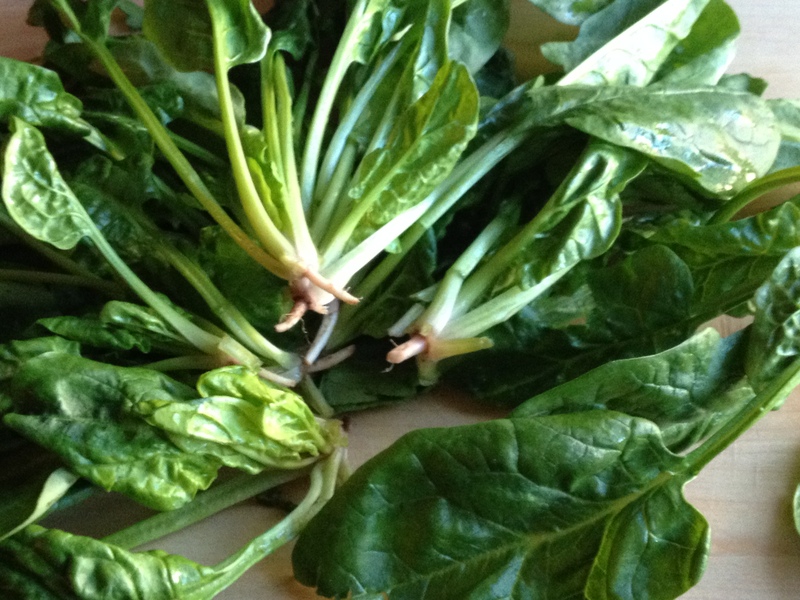 More often available here is small leaf or ‘baby’ spinach with sweet, light leaves and thin, tender stems. Baby spinach makes for an overall lighter dish. Large leaf spinach gives a delicious earthy, almost minerally taste to your spanakorizo but the stems are often tough and stringy so I usually cut them down quite short. Don’t worry about the tougher, larger leaves here as the cooking time for this recipe allows them to soften up fine. If you go with frozen chopped spinach, make sure to let it thaw before using and drain off any liquid. A whole 10 ounce bag, the usual amount that frozen spinach comes in, will give you a spanakorizo that is very spinachy. I think using 3/4 of a 10 ounce bag (1 cup) will do fine unless you are a big fan of spinach! 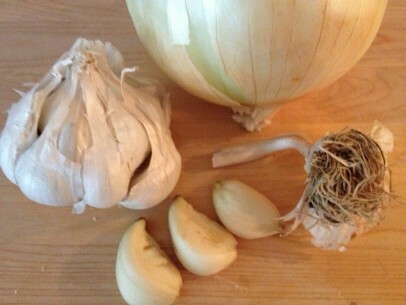 And I’d suggest chopping your onions and garlic fairly small, no rough chopping here. You don’t need to go for a tiny dice but keep in mind you may get 2 or 3 pieces of garlic per fork and 3 big chunks could easily overwhelm your taste buds and upset the flavor balance of the dish entirely. 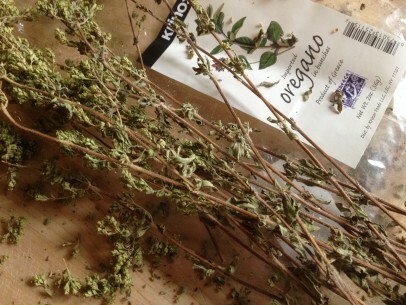 This recipe gives you herb options too. Both fresh dill and fresh mint are delicious partners to spinach – on their own or in combination! Try each and see which is your favorite. And remember to use authentic Greek oregano whenever possible and preferably off the stem and not bottled. Traditionally spanakorizo is made both with tomato and without. Its just a matter of personal preference really as its just as tasty either way. Sauté onions and garlic gently in olive oil over low heat. Add salt, pepper, oregano and dill or mint. Stir to combine well. If adding tomato – mix tomato paste in 1/2 cup of warm water. Add to pot. Mix ingredients well. Add rice and cook for 5 minutes stirring often. If rice starts to stick to the bottom of the pan, lower the heat just slightly. Add spinach and 3 cups water to pot, mix well to combine and bring to a low boil. Once you’ve reached a low boil, lower to a very gentle simmer and cover. Cook for 25-30 minutes. Check the rice for doneness at 25 minutes. It may need an additional 5 minutes or so for longer grains. When rice is completely cooked, mix ingredients well, cover and set aside for at least 15 minutes before serving. This recipe serves 4/6 – a family of 2 adults, 2 children with leftovers OR 4 adults. also made this dish earlier tonight. delicious! This is so delicious! Have you ever made it with brown rice? Any idea of the cooking time for that? Hi Heather! It’s one of my favorite meals 🙂 I’ve never made it with brown rice but based on cooking with brown rice in toehr recipes, I think it would be safe to add maybe 1/3 cup more water and cook, covered, for an additional 20 minutes or so. That;s for medium grain brown rice. Long grain I’m not sure. Hope this helps and please let me know how it turns out! Thanks, Kiki! I plan to try it tomorrow, so I will let you know! Oh my. I’m not sure what the stature of the four adults is supposed to be, but I just ate half of it by myself. Delish! Bravo! Amazing, flavorful dish! Made this tonight, and it was a hit for the family! Made Yiayia proud 🙂 Thanks for the recipe! I vary among the rices when I make this dish. Sometimes I use brown basmati instead of white. But I like the Arborio (risotto rice) the best. Since I don’t like to cook the life out of the spinach I cook the rice first, including the onions, garlic, oregano etc. in veggie broth; shortly before the broth is completely absorbed I stir in the raw spinach and in a few more minutes the dish is cooked. When using brown rice which takes a bit longer it is especially important. One can also make the traditional risotto and add the spinach toward the end. Lastly, sometimes I use chopped carrots, celery, red peppers, squash, tomatoes whatever I have on hand which I cook with the rice from the start but still add raw spinach toward the end. It makes more of vegetable rice pilaf. Growing my own lemons and being a fan I use lemons and zest in many of my dishes, but like the spinach I add these items just before the dish is fully cooked. Love your recipes but unfortunately I assumed your “Print” button would print a printer friendly page. I just wasted about 25 pages printing only 4 recipes because every picture, link and comment was printed as well. Just made it tonight with a blend of brown rice and farro, which I cooked separately (these days I cook rice/farro in lots of water and drain, like pasta) and added near the end. The change makes it more nutritious though less authentic in taste and texture. Thanks for the delicious recipe. A variation I love is to add. A can of pumpkin (not the pie) with the tomato. Bulks it up nicely and givrs a creamy texture . Just made this using the tomato paste option. Absolute perfection. It tasted exactly like my beloved mother used to make it. 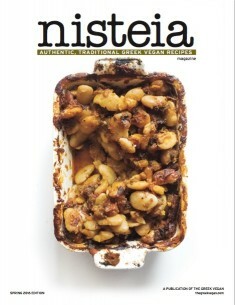 I cannot thank you enough for the authentic recipe, and all the beautiful memories because of this dish. Oh no, please, regular onion is not what I grew up on with this dish. The taste is so much better if you use a bunch of scallions, white and green parts, chopped up and added with the dill and rice and spinach and water and oil ALL at once at the beginning. Yes, squeeze lemon over the serving AND crumble feta on top. Made this last night but with riced cauliflower instead of rice, and it turned out amazing! I mixed the tomato paste with white wine, and added a few splashes instead of the water since I wasn’t cooking rice. Yummy!!! Hi Kiki, I made this tonight — super good! I used a chopped up fresh tomato instead of paste, and it was about a cup of tomato, so I lowered the water to 2.5 cups. Delicious. Thanks so much for sharing. 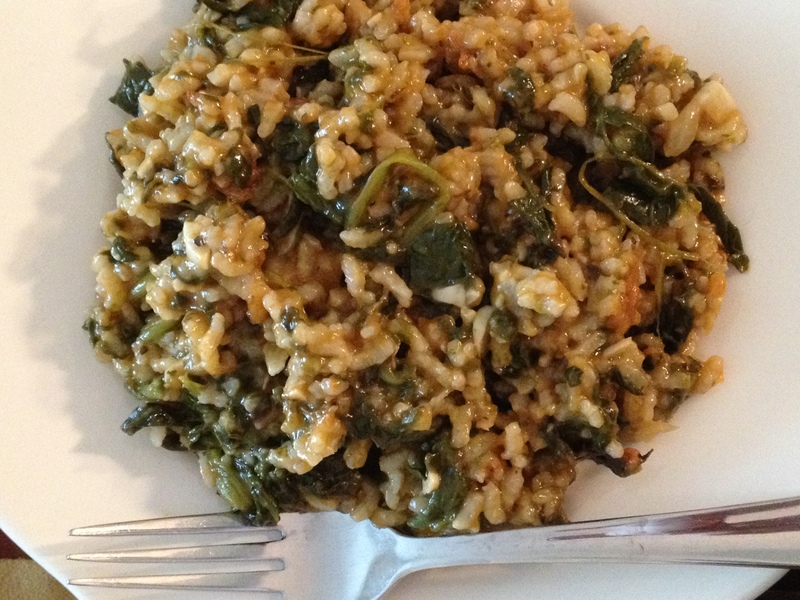 Just made this with basmati brown rice….yum. I add the spinach after the rice has simmered for 15 min. I also use organic (when available) crushed tomatoes instead of sauce or paste for a richer sauce and lower sodium level. Looking forward to a comfort food dinner! Can you estimate the calories in a 3/4 serving? Love this dish but never had it with garlic!